It rained here all weekend so on Saturday I wrapped gifts and enjoyed listening to Christmas music. Looks like another great menu! I'll be over for the bacon cheeseburgers. Those are my favorite. Hope you enjoy them!! It is amazing how we are in the holiday season already. I love how you plan out your meals they all seem so good and great for your family. I can't believe that we're already into the holiday season! It seems like it was July just a week or two ago. I love the menu planning. It's helpful year round but also to make sure you don't end up with leftovers when Christmas dinner day rolls around. I didn't really buy much on Cyber Monday either. We did watch Home Alone over the weekend though. That was fun! We have a big pile of holiday movies to get through. OK I'm telling you right now I'm coming over for dinner LOL. You have some great plans for the week and I have no plans. I think I could make all of these in my family would love all of them. My weekend was pretty good. My kid came home from college for the weekend. Funny, I totally LOVE doing his laundry. I'm sorta his personal laundry folding service here as of late and I don't mind one bit. It's super hot where I live, so we stay inside for the opposite reason. Haven't even started Christmas shopping yet and need to get on that. 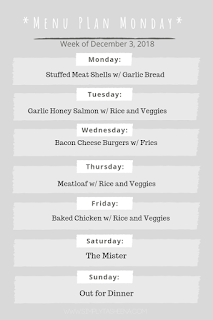 Your weekly menus are always great places for me to get a meal idea. Garlic honey salmon sounds like a great recipe! Oh, garlic honey salmon sounds really good. 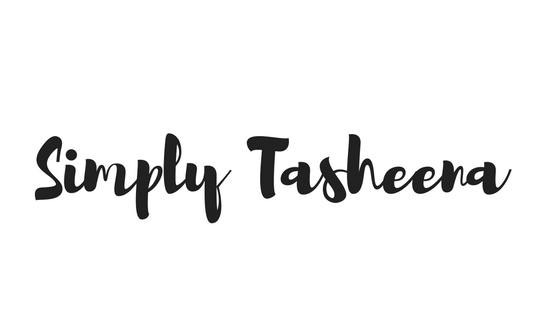 I need to get back into weekly meal planning. OOOO! That garlic honey salmon?? That would be a hit at my house. I need to try that. How time flies so fast! Christmas is fast approaching, these are perfect recommendation of planning so everything will be control well to prevent leftover. Wow! Decemeber my favourite month is here. Love December because it has Christmas but also because it is my Birthday month. You have quite a spread lined up for the week. I love your menu list for this week . All of it is very mouthwatering, however Monday meal is stood up among the rest just because I've been craving for garlic bread. I've gone done the Holiday movie watching rabbit hole as well haha. 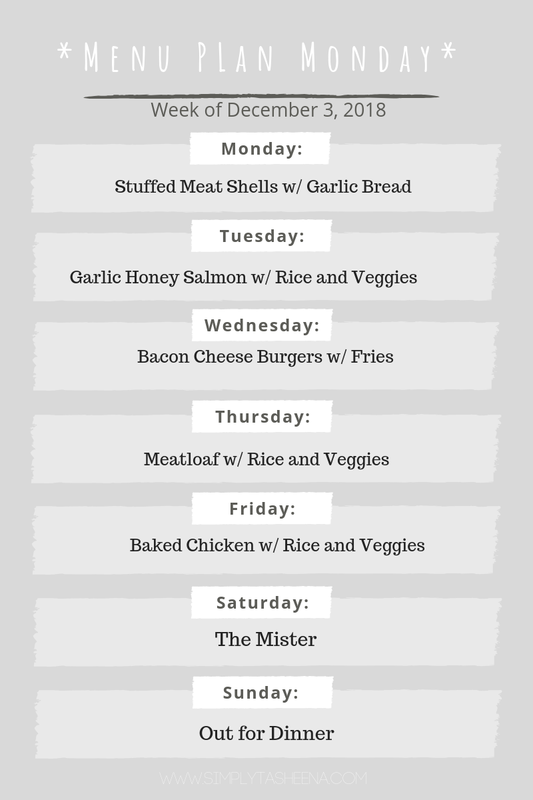 Great idea to do a weekly menu! Indeed it flew like a tornado, the time it seems. The baked chicken and rice with veggies is my jam.